Sorry about all the letters. My toenail got stuck on the keyboard. Geesh. Mom just trim them, too. It's been a crazy Summer this year. Rainy, humid & hot. I tell ya, the humidity doesn't do much for my fur. I'm surprised it's not sticking out all over. I also found out rain water doesn't seem to make my fur softer either. Oh well. I'm just happy I didn't have to swim out of the house and we do have air conditioning. We hope everyone made it through the flash flooding problems without any major water damage. Today is Elizabeth's last day until Thanksgiving Break. She's heading back to college. We will miss her but she's ready to go back. I have lots of exciting news for you this month. Mom, Grandma and Elizabeth have been very busy. First, did you notice our new logo? We also have a newly revamped website. Elizabeth has been working hard to get some of our fabrics put into groups that you can easily find on the fabric page. I even have my photo on the homepage. The lady who designed it for us, says she just loved my photos. What can I say.... I'm just adorable and lovable. Don't tell Mom I said that. She says I need to be more modest. Let us know what you think. I know Mom and Elizabeth are still working on it. So, there maybe a few small problems with it. 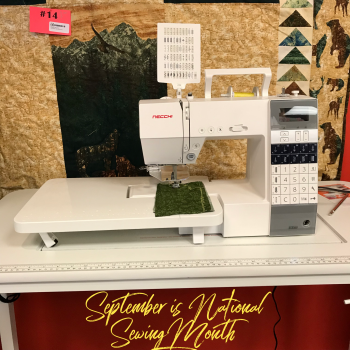 To kick off National Sewing Month, our Free Pattern and Demo Day is on Saturday, September 1,2018 starting around 10am. We will have a door prize and refreshments. We would love to see any projects you've made using previous months patterns. Everyone loves a show and tell. It's like a mini quilt show and a great way to see other quilters ideas. Grandma is hard at work getting the demo ready for you. It will be pretty neat little project. I think you will like it. 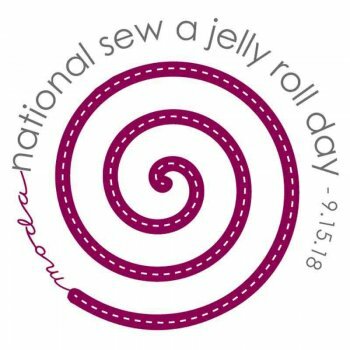 Saturday, September 15, 2018 is National Sew a Jelly Roll Day. We will be having a big event to celebrate National Sew a Jelly Roll Day. There will be free demos on how to use jelly rolls throughout the day. Hot dogs, drinks and jelly related munchies available to eat. At 1pm, we will be doing a jelly roll race for everyone who would like to join in. It would be a fun event to have your child or grandchild help you participate in. You must provide the jelly roll, thread and we recommend to bring your sewing machine as our loaner numbers are very limited. We would like to keep them available for drop in participants. Keep an eye out for more on the Jelly Roll Day Celebration. I will put out an email telling you more about it a little bit later in the week or beginning of next week. Mom will be posting updates on the event on Facebook. Sometimes she's a little slow on that. She's been very busy servicing sewing machines this Summer. I try to lend a helping paw when I can. There just isn't enough room in the monthly newsletter to put in all of the happenings for that day. I almost forgot, we will be closed Monday, September 3, 2018 in observance of Labor Day. I have one other important date for you to put on your calendar. September 29 & 30 is the Endless Mountain Quilt Guild Quilt Show at Lynch-Bustin Elementary School. The hours are 10a-4p and admission is $5.00. There will be, of course, lots of quilts on display, Cathie Wiggs' bed turning, lots of vendors, including us. Our website calendar has local and not so local quilt events with links to the organizations websites and/or Facebook Page, plus google map links to help you get directions to the events. Our class and events are also listed in the calendar. Just click on the event or class to get more information. Gosh! I guess I threw a lot of information at you this month. I'm sorry if I overwhelmed you. I will be sending out more emails this month to remind you of upcoming events in addition to sales events. I will try to combine them when I can so your not getting bombed with emails from me. I know Mom doesn't like to getting lots and lots of emails from one place. She doesn't have time to read all of them. I imagine all of you are just as busy. That is all I can think of to tell you for today. I will send out an email with better details on our National Jelly Roll Day Event. Stay cool for the next few days. I plan on staying in the air conditioning, drinking lots of water and eating as many treats I can con, I mean ask for, from Mom and Grandma. Belly rubs and ear scratches are also on today's schedule.